Can’t go wrong w/ dinner and drinks with friends at LA hotspot, Koi. This upscale, chic & trendy, asian-influenced restaurant has a beautiful atmosphere and great Japanese cuisine. 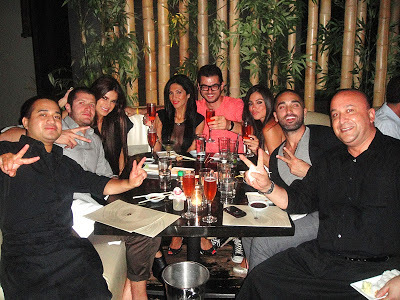 I went with a group of friends and we all ordered small dishes, and lots of champagne lol. Koi is great for a romantic date night, dinner with friends, business meetings or any special occasion. Spicy tuna on crispy rice w/ sliced jalapeno on top. One of my favorite dishes to order at sushi. You can’t get this dish wrong! Amazing. If you like oysters, these were great. Not too big, (the big ones freak me out), they were smaller and with hot sauce and lemon they are very fresh and good quality oysters. Loved this dish! I love anything with black truffle, and I’ve never had salmon carpaccio before so this was something different for me. Very fresh tasting, and the black truffle with the citrus sauce was a great mix of flavors. Definitely would recommend this dish! Loved this! Another great dish. I love fresh, good quality, raw fish. Especially in a light ponzu sauce. I crave this a lot when I go to sushi! Love fresh fish. Jalapenos add a nice kick too. This is one of my other favorite dishes, besides Spicy Tuna on Crispy Rice, to get at a Japanese/sushi restaurant. Some places make it better than others, Koi makes a great one! It’s basically popcorn shrimp tempura in a creamy semi-spicy sauce, and a ponzu sauce to dip. Love it! Half eaten already, I apologize lol, but another great special roll off the menu. Koi has great Japanese food, but what really makes Koi special is the atmosphere of the restaurant. It’s very LA and “sceney”, but also very romantic and beautiful, it’s Asian decorated and dim-lit with candles. Great upscale sushi restaurant in LA. For other Koi locations check out the website.